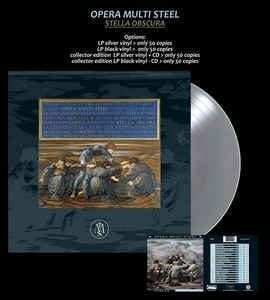 Background/Info: “Stella Obscura” was the fourth full length released by the French ‘cult’ band Opera Multi Steel. The original version, released in 1992 on the band’s own label, Orcadia Machina, featured 17 songs. This vinyl version with a new artwork is only featuring 9 songs from the tracklist although there’s a limited vinyl edition featuring a silver disc with a bonus CD where you can listen to all the songs. Content: The work sounds in the typical and rather unique of OMS. The style rapidly appears to be a crossover between different influences, which we can easily resume as gothic, new/dark-wave and folk. The song writing is sophisticated and still delicate while you still can notice a late 80s influence. The songs are sung in French (with the exception of one track sung in Latin language). The last song “Memorias De Vigo” is driven by Eastern-like influences, being a little less atypical for the band. 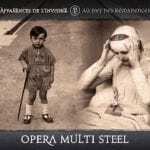 + + + : Opera Multi Steel stands for sweet melancholia and dark poetry. This is exactly what this work is all about. This album brings the intimate sphere created by the band alive. It’s a delicious merge between electronics and authentic instruments. It’s an intelligent composition revealing some of the band’s finest tracks. The already mentioned “Memorias De Vigo” remains a real great cut. – – – : The songs are pretty similar although revealing this typical sound the band became famous with. It’s a bit strange to get a vinyl format featuring only 9 tracks. A double vinyl might have been a better idea. Conclusion: This vinyl format will bring you back in time. It definitely is a collector’s item for the band’s fanbase. Best songs: “Memorias De Vigo”, “Spacio Astro”, “Tes Lèvres, Un Abat-Son”, “Les Martyrs”.